If you want shade, Archadeck of Central GA can deliver! These Macon, GA, homeowners called us in to construct a shade structure—with a fan—over their patio. We love using fans outdoors. You should not have to go indoors for a breeze on a day when Mother Nature is not providing any. The concrete patio along the back of this 1950s ranch-style house is 18 feet wide. The project we designed and installed is an 18-foot pergola covered with a Tuftex PolyCarbonate sheet. 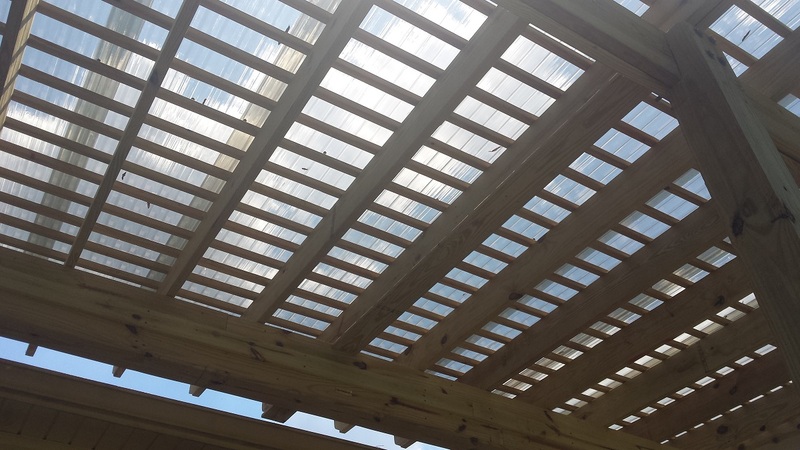 This cover allows some light through but blocks the direct sunlight, so it is the perfect pergola cover. We always caution homeowners that a pergola does not provide 100% shade as you would get with a solid roof. 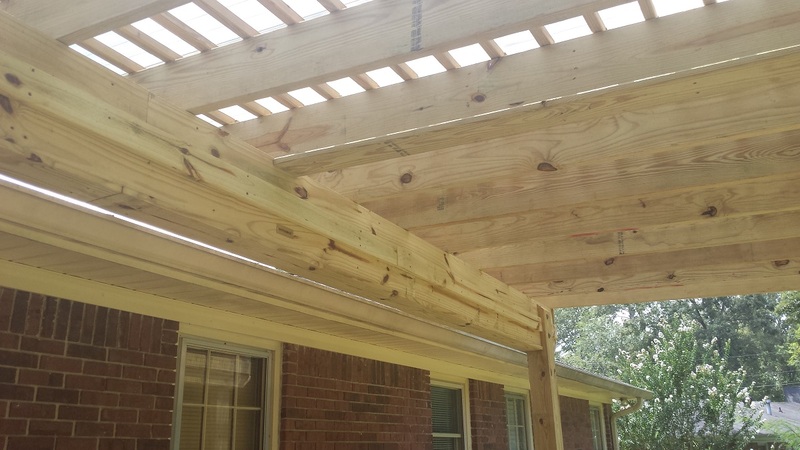 The top of a pergola features purlins and rafters running in opposite directions to create a crisscross effect. The amount of shade you get from a pergola depends on several factors including the angle of the pergola in relation to the sun and the dimensions of the purlins and rafters. To create more shade, we recommend installing polycarbonate sheeting across the top of the pergola. This material is very sturdy and reduces the amount of heat on your porch or patio without blocking all of the light. Most polycarbonate sheeting will come in more than one color. The product we used here, Tuftex, is available in clear, translucent white and smoke-tinted options. Many outdoor living projects present their own special challenges, and that was the case at this home, too. 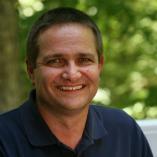 Archadeck of Central GA, your Macon, GA, pergola builder, does not back down from a challenge! Challenges keep us young and keep us on our toes. In this case, the challenge began with the fact that the patio we were covering is 18 feet wide across the back of the house. Ideally with a span that wide, we would use three posts across the front of the pergola and three posts across the back (the side closest to the house). However, there were two issues with that “ideal” design. First, while the concrete patio was in good shape, it had settled a bit over the years, and we did not want to add more weight to the patio. Second, a middle post would have been four feet out from the house restricting the use of the patio. To navigate these issues, we designed a pergola with three posts supporting the front of the pergola but only two on the back. To make this work, we spanned the entire 18-ft. width of the pergola, on the back side, with a large PSL beam to carry the weight. We needed the strongest beam possible to eliminate the need for a middle post. PSL stands for parallel strand lumber, which is engineered wood made from parallel wood strands bonded with adhesive. We built the pergola with pressure-treated pine, and we wrapped the PSL beam in pressure-treated pine as well so it would match the rest of the structure. As mentioned above, we covered the finished pergola with a large Tuftex PolyCarb sheet in the tinted smoke color to provide additional shade while allowing light to filter through. 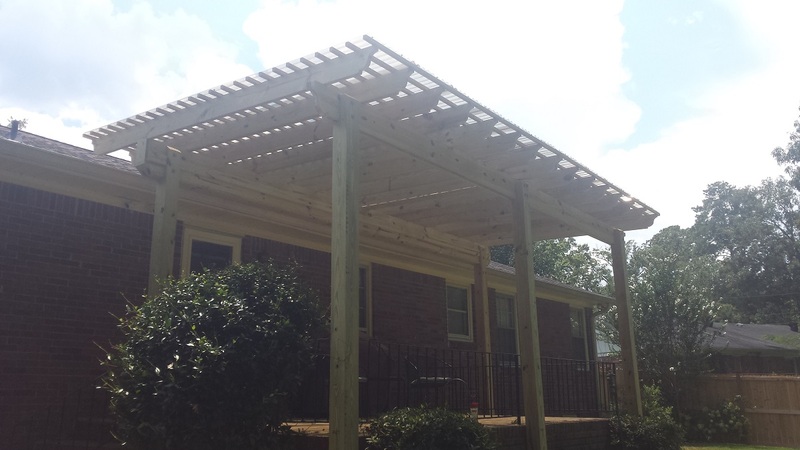 With an impressive new pergola over their patio, these happy Macon, GA, homeowners got the shade they wanted and a fan, too. Their son is an electrician so he will take care of installing the fan. Archadeck of Central GA is always happy to work with others on a project if clients want to use their own contractors for electrical work, plumbing, etc. If you are interested in adding a pergola to your outdoor living space—or perhaps you need a deck or patio installed to go with that pergola—contact Archadeck of Central Georgia for a design consultation. You can reach us by phone at (478) 745 – 2000 or via email at [email protected].